Card Review: 9.9 This card immediately became one of my favorite Wallach cards the second I pulled one from a pack for the first time. I even remember the exact spot on the floor in the house in Phoenix where it happened. My father's childhood friend Ross had flown in from Rome, NY to visit. Ross came armed with a box of 1988 Topps, and cello pack box of '88 Topps for my brother and I to split. My brother and I spread out on the floor to tear in and stuff our faces with gum. Ross owned a tobacco/candy distribution warehouse in Rome, and subsequently had cards much sooner then the general public. So this was our first look at the set, and also made us the first kids in the neighborhood to have them by a couple of weeks. Ross was always my brother and I's favorite visitor. This Wallach couldn't have been more impressive to me if it was glowing inside the pack. I'm sure I took pause, slurring though a mouthful of gum, to show off this master piece to everyone else. Ross was also the guy who started giving me a box of cards every year when I was born, well before I was old enough to do anything but drool and chew on them. The '83 Topps box he gave me was the box I pulled my first Wallach from, and he inadvertently is to blame for starting this collection. Wallach was a National League All-Star five times (and deserved to be at least another four times). 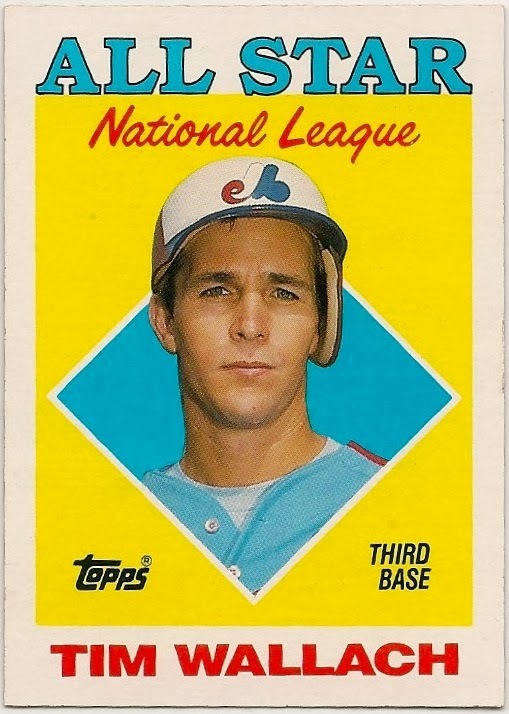 As a kid it used to irritate me to no end when he would make the All-Star team and not be included in the Topps All-Star subset. 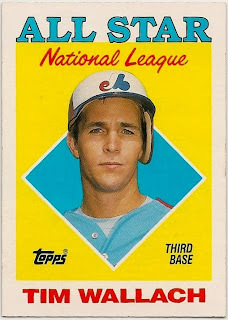 I've learned since then, that I had a fundamental misunderstanding of how Topps did their "All-Stars." They only took one player from each position, not all the All-Stars, making the actual All-Star team wasn't even required. 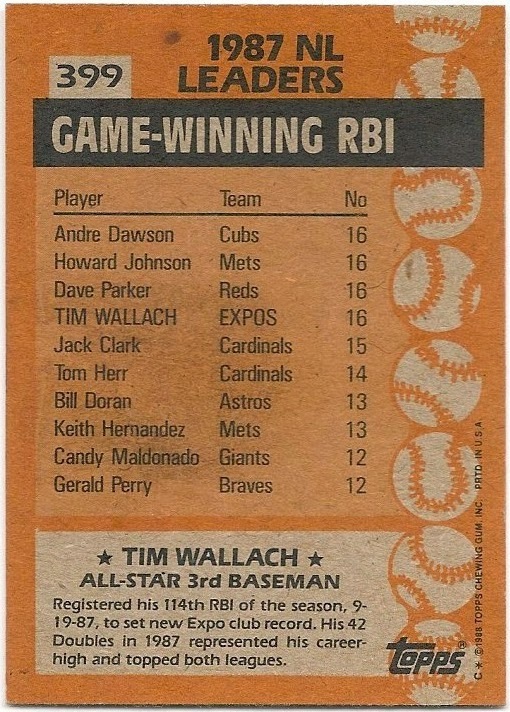 So the fact that Topps did two All-Star cards of Wallach wasn't a slight, especially considering he was never named a starter on the All-Star team (though he should have been at least two or three times). In any event, this card was, and remains one of my All-Time favorite Wallach cards. As an eight year old I actually had my mother (who was an art teacher, and remains a fantastic artist) draw a giant poster of this with crayons, which I proudly hung on the door of my room for a couple of years until there was nothing left scotch tape could do for it. I'm sure she wished she hadn't because she ended up doing similar ones of other players for all the kids on the street. By the end I think she was mailing it in, because there were some funky looking Don Mattingly and Kirby Puckett's coming out of her "studio." You may have noticed that this card also serves as the banner for this blog. It very nearly became the very first card posted. Instead I went with the '83 Topps because it was the first Wallach I ever had. At some point along the way I decided I wouldn't post this card until I ran out of new Wallach's to post. Now after posting 336 different Wallach cards and a slew of other Wallach related items, I am out of new Wallach cards to post. That doesn't mean I'm done posting. For one, I'll keep posting when I receive cards in the mail, or make a large acquisition. Which I've come realize, is kind of the point of this collection. Collectors can disparage the "junk wax era" all they want. But I love it. No matter how ugly, expensive, or otherwise profane modern cards become, I will never run out of material to collect and always be able to chase the cards that I find most enjoyable. Also, officially there are 25 Wallach cards I don't have. So naturally, a "Most Wanted" list is going to be making a debut. The number 25 is a bit misleading as ten of them are individually serially numbered cards with production runs from 1 to 5 copies. Another eight are "buybacks," regular cards but repackaged and autographed or otherwise slightly altered. I'm comfortable saying there are about seven "real" cards I don't have. In addition to cards there are also non-cards that show up in some of the databases that I'll be tracking down, and putting on another list. 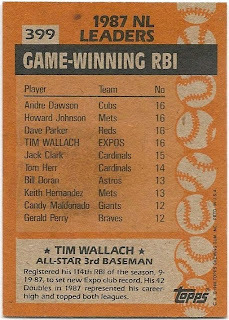 I wouldn't lose any sleep if I never track them down, and if I did actually acquire "all" the millions of Wallach cards but none of these "things," I would consider my collection complete. These are things like post cards put out by the Expos, buttons, and bookmarks. Things of that nature. I also still have some Wallach memorabilia to post, and am always on the look out for more. I hope I never become a bat collector (those guys are weird) but wouldn't mind a couple more, and I certainly have room for more jersey's and would love to find a hat, some additional batting helmets, and whatever else is out there. Every so often something pops up on ebay that I never even knew existed. After some debate, I've also decided that I'll be posting cards of the Wallach kids. I'll do those cards in the same style as a regular post, but won't be giving quantities. It's not my intention to collect all of their cards. One each is fine. So while this may be the last "new" card to show up for awhile, this blog isn't going anywhere. Not as long as there are people selfishly holding on to Wallach cards in their parent's attic, and other places. Historic post. I'm almost as sad as I was when I finished reading "Childhood's End" by Arthur C. Clarke. I'm glad the blog is here to stay, though! The 1988 Topps All Star subset is my favorite of all their in-set All Star subsets. I heartily approve this post. As for the "seven" - please post them ASAP. I am always on the look out for other bloggers wantlists, especially the esoteric or unusual. I have that card if anyone is interested.